By the time a piano is played for the first time, hundreds of hours have gone into its construction by skilled artisans. If it is well-loved, the musicians who coax music from it will spend hundreds—if not thousands—of hours lingering over the keys, getting to know its particular qualities. But when the instrument is broken or damaged beyond repair, what happens to this object that has had such a storied life? 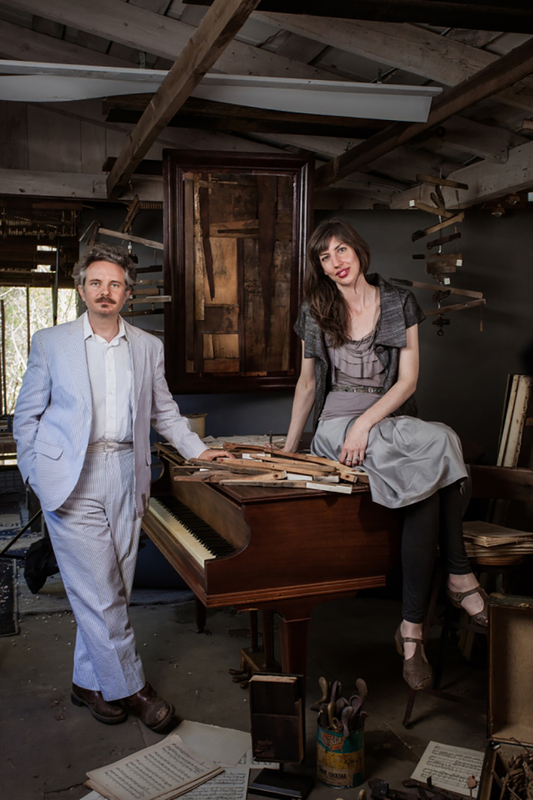 Asheville artists Kehren Barbour and Michael Luchtan are creating new compositions with retired, abandoned pianos in their Gerton studio. A painter with a professional background in set design, Barbour says she found herself asking big questions about the impact of human actions and consumerism on the environment. She moved from San Francisco to Boone to pursue a masters degree in sustainable development and Appalachian studies at Appalachian State University, moving to Asheville in 2013 and meeting her husband Michael Luchtan, a mathematician, composer, and music teacher. A friend who knew of their interests connected them with their first retired piano, which they decided to use as a material for exploring the idea of sustainability through art and music, and the Post Piano Project was born. The couple rented a former produce stand on Highway 74 in Henderson County to use as a workshop, dubbing it the Aeolian Harp Research Station. There, alongside the music of the creek and the sweep of the wind through Hickory Nut Gorge, the two create works of art with instruments that were destined for landfills. Then, a lengthy deconstruction process begins by weathering the instruments outside. “Glues that are used to hold a piano together are of a very high quality, and harnessing the forces of nature can be most efficient way to disassemble some of the pieces,” Barbour says, and it can take more than a year of weathering to prep a piano for “harvesting” its parts. Once a piano is disassembled, Barbour uses each of the elements in different ways. The assemblages of her Tone Poems series (named after Strauss’ tone poems) are three-dimensional works consisting of anything from the wooden part of a piano body to the hammers that strike the inner cords when a key is played. Her collages are three-dimensional, too, but are composed of strips of veneer harvested from the decaying pianos. Weathering gives each strip distinctive tones and textures. While these two types of work are meant to become part of an art or music lover’s personal collection, Barbour’s installation pieces (she’s created four so far) invite interaction. At the 2014 and 2015 ReHappening events paying homage to Black Mountain College, Barbour and Luchtan set up several of their installation pieces in the room where John Cage had worked on his famed composition 4'33". Consisting of the harps and soundboards from salvaged pianos, these new instruments collect vibrations from their environment by being played or even interacting with the wind. So far, Barbour and Luchtan have dissembled 37 pianos, removing 20,000 pounds of materials from the waste steam and turning them into art. Equally important, Barbour says, are the conversations the artists have had as a result of the project—about music, art, and the way they can impact our overburdened planet. Parts of the project can be seen at several Asheville venues, including London District Studios, Horse+Hero, and Vortex Doughnuts, with works for sale at Harmony Piano Salvage, located at the ScreenDoor. Find out more at www.kehrenbarbour.com.